Short, concise consumer-friendly label. 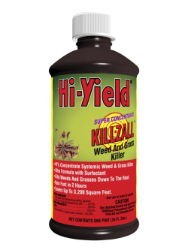 Contains a double-surfactant formulation that dries on plant fast to start working quickly. Multiple use formulation: use near fences, in paths, patios, sidewalks, curbs, and driveways. Around ornamental trees, shrubs, flowerbeds, and buildings. Labeled for lawn renovation, brush and vine control, and stump treatment.